In The Fated Stars by Veronica Scott, Samell is an empathetic priest who was kidnapped and sold to a carnival where he’s forced to tell the fortunes of paying guests. He is resigned to his existence until mercenary, Larissa, steps into his tent and he sees in her a fierce spirit with the potential to keep him alive. When Samell and Larissa attract the attention of dangerous foes, can they get out alive? The author, Veronica Scott, gave me a copy of this book in exchange for my review. The Fated Stars by Veronica Scott is a gender swap on the stereotypical damsel in distress tale. Larissa is tough and capable and looking toward the next payday. Samell is trapped in a circus. He’s the main draw in a fortune teller exhibit using his powers as an empathetic Priest of Thunn to give vague reads to revelers killing time. He is utterly trapped within himself (literally as he’s stored in stasis) and has given up all hope that he may someday be free of his kidnappers. When Larissa attends the circus with some friends after a successful job, Samell spots in Larissa the blue fire of a warrior of Thunn and suddenly he knows that she is the one person that could help him to freedom. Of course, his kidnappings and the reasons for it are complex and when they are thwarted out of the gate, there is leverage to put Samell back in his place, but will Larissa give up? Scott is clearly a planner. She has worlds that she likes and wants her novels to live in and they have intersected. Futurism with a heavy dose of mysticism. A mix of tradition with the down and dirty of living on the edge. Larissa is used to riding where the jobs take her. Does she get thrown in jail? No big deal, it’s par for the course. Larissa is practical, direct and heavily cautious. She has a good soul but is usually more into a winning proposition than involving herself in the problems of others. Samell is her antithesis. Initially, when Larissa is trying to get him and get out, he’s throwing caution in the wind and wanting to start a stampede of freedom. His word is something he takes very seriously and he is cheesy to an extreme. For some readers, his tendency to the dramatic may quash their dreams of an alpha male looking to crush the wilting flower in his arms but neither of these characters is the fainting type. The Fated Stars is a complex story and an interesting one. There’s a lot of “hurry up and wait” but the quiet moments illuminate the characters and propel the plot. There was an instant attraction that Scott built upon so that the attraction blossoms in a way that is perhaps not realistic but is billed as fate, so does it really need to be? Their relationship ties into the mystical side of the story. It’s going to happen and we all know it will so the point isn’t their romance but the way that Samell and Larissa are extricated from their precarious situation. Scott’s descriptions are rich and colorful. She clearly has plotted her universe carefully and the species within and while each book enhances the next, none rely on each other so that readers can start at any point that catches their interest. There was something I didn’t like and as much as I love Scott’s stories, it would be a disservice not to mention. Samell’s jealous, whiny, one-dimensional ex. She is the kind of petty and spiteful person whose real purpose is never built and only serves as a red herring, but is it really? We get it. Samell is hot. There’s no one like him and no one who will ever be as good as him to this one woman who can neither stand up to fate or the powerhouse that is Larissa. I love a good female baddie but she read as an afterthought. Overall, The Fated Stars is a story worth reading. 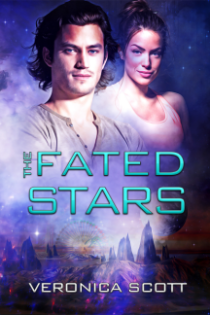 If you like romance and don’t mind cheesy, The Fated Stars is a story not be missed. Pick it up today. If you want to read reviews of Veronica Scott’s other books, be sure check the Sector series and the God of Egypt series here. For more information Veronica Scott and her work, visit her website. You can connect with her on Facebook, Goodreads, Google+ and Twitter @VScotttheauthor. Series readers can track The Sectors and Gods of Egypt series on FictFact.